This exceptional coffee was selected as the No. 24 coffee on Coffee Review’s list of the Top 30 Coffees of 2018. 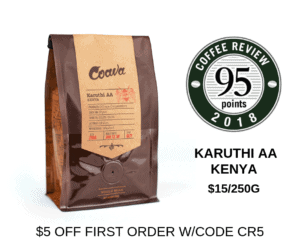 This coffee tied for the highest rating in a tasting of natural-processed single-origin espressos for Coffee Review’s August 2018 tasting report. With its generally elongated beans and distinctive floral and crisp, often chocolaty cup, the Gesha variety of Arabica continues to distinguish itself as one of the world’s rarest and most unique coffees. Although the Gesha originated in Ethiopia, it was “discovered” by the coffee world in 2004 growing in Boquete, Panama, and Panama continues to dominate the expanding world of Gesha. This particular version, however, is the outcome of efforts to commercialize Gesha in the region from which it originally came. It was grown in western Ethiopia by farmers Adam and Rachel Overton and their indigenous Meanit culture collaborators from seed selected from wild trees in the nearby Gori Gesha forest. This is a dry-processed or “natural” version, meaning the beans were dried inside the fruit rather than after the soft fruit residue has been removed, as is the case with wet-processed or “washed” coffees. Small Eyes Café is a small, family-owned coffee shop in Yilan, Taiwan, specializing in artisanally roasted specialty coffee and homemade desserts. Visit https://www.facebook.com/Smalleyescafe for more information. The Bottom Line: A strikingly original natural-processed Ethiopia Gesha, with high-toned floral notes, a suggestion of musky cannabis, and a complex, exhilarating presence in milk.